This book is for the seeker in all of us, the collector of wisdom, and the person who asks, "What if?" from the author of "Seven Men: And the Secret of Their Greatness"
The Greek philosopher Socrates famously said that "the unexamined life is not worth living." Using this as a starting point, Eric Metaxas created a forum encouraging successful professionals to actively think about life's bigger questions. 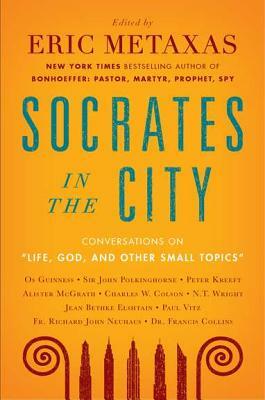 Thus, Socrates in the City was born. First presented to standing-room-only crowds in New York City and written by luminaries such as Dr. Francis Collins, Sir John Polkinghorne, and Os Guinness, these original essays grapple with extraordinary topics from "Making Sense out of Suffering" to "Belief in God in an Age of Science." No question is too big--in fact, the bigger, the better--because nowhere is it written that finding the answers to life's biggest questions shouldn't be exciting and even, perhaps, fun.